The Gabbay Award is presented each Fall. Please submit nominations by January 31. Contact Paula Shelly at shelly@brandeis.edu for more information. Early in 1998, the trustees of the Jacob and Louise Gabbay Foundation decided to establish a major new award in basic and applied biomedical sciences. The Foundation felt that existing scientific awards tended either to honor people who were already well-recognized, or to focus on work that had its primary impact in traditional basic research fields. Yet the history of science suggests that most scientific revolutions are sparked by advances in practical areas such as instrumentation and techniques. 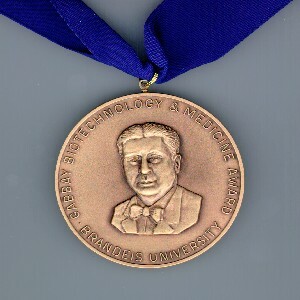 The Foundation therefore created the Jacob Heskel Gabbay Award in Biotechnology and Medicine to recognize, as early as possible in their careers, scientists in academia, medicine or industry whose work had outstanding scientific content and significant practical consequences in the biomedical sciences. The award was renamed the Jacob and Louise Gabbay Award in Biotechnology and Medicine in 2016 to honor Jacob's wife, Louise Gabbay, who was instrumental in founding the award. The award, given annually, consists of a medallion and a $25,000 cash prize or $30,000 to be shared between multiple winners. Recipients travel to Brandeis University in the fall of each year and present a lecture on their work, followed by a dinner at which the formal presentation takes place. Nominations are solicited from selected scientists in industry and academia. A panel of distinguished researchers representing the biotechnology and pharmaceutical industries, as well as universities and schools of medicine, is assembled to consider nominations.